You are here: Home / Educational / Who is the biggest? Following on from my guilt over not spending enough one on one time with my middle child lately, today I tried to think of something fun for her to do, whilst working on her number skills, which are a little lacking at the moment. First I asked her to line up our shoes in order of biggest to smallest. 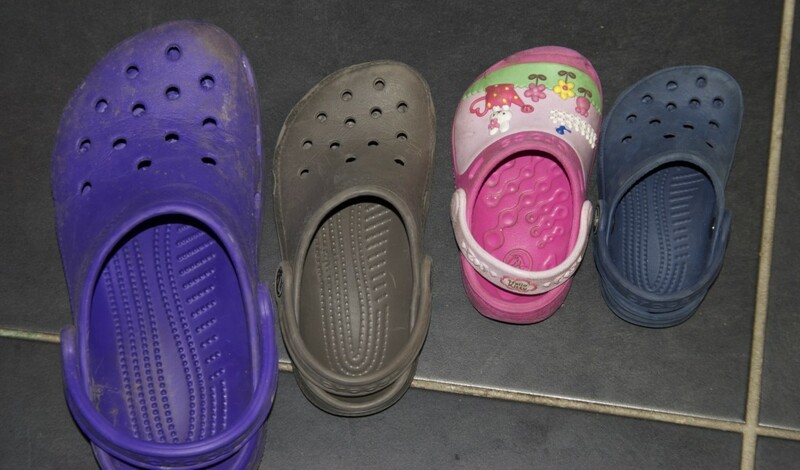 Apologies for the crocs, but they are handy for running around the garden. 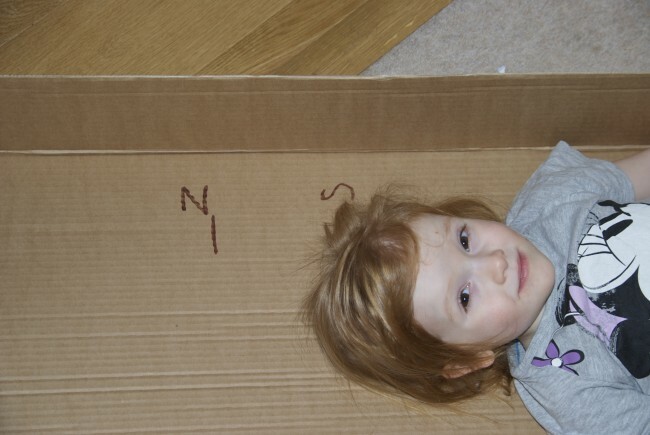 Then we each lay down in a huge flat box and Z helped her mark how tall everyone was. We decided to see how tall everyone was in duplo bricks. Then we counted them all up. We found there were 2 and a half of the bricks with 8 circles on between each child. 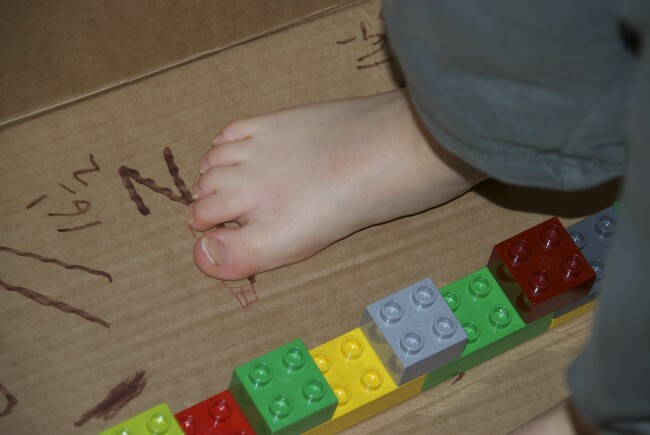 Then Z counted how many of his feet tall he was. 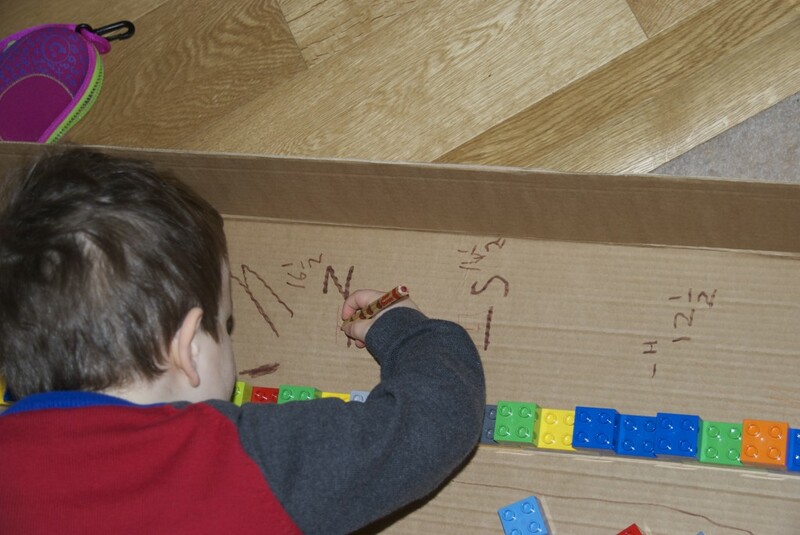 Z wanted to try using normal Lego bricks but we though that might take a bit too long! We all had a lot of fun, and I think little S can now count a bit further than she could this morning. That is a fab thing to do! My daughter is Megabloks mad and I have bought her some Lego for her birthday. I think this would be a good activity for when she is a little older! Seems like they had lots of fun! That is such a good idea especially the Duplo! Brilliant! Nothing wrong with crocs – mine are bright pink and I’m proud of them! Oh what a surprise to see you here! Measuring size is such a great thing to do. The inside of one of my cupboards is used and i keep saying if we ever move we will have to take the door with us! What fun activities to compare sizes and measurements. Thanks for sharing on Monday Madness. Such cute and clever ideas! You should have taken them outside though so it could really have been outdoor play fun! Thanks for linking up but next time we would love to see what fun you are having with your kiddos outdoors! fun way to do math & reinforce numbers/counting! thanks for sharing on the sunday showcase!